This article is about the original song. 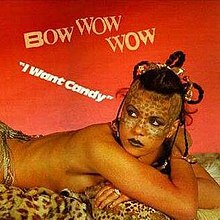 For the Bow Wow Wow album featuring a version of it, see I Want Candy (album). For the 2007 film, see I Want Candy (film). (1965) "Out in the Sun"
"I Want Candy" is a song written and originally recorded by the Strangeloves in 1965 that reached No. 11 in the U.S. Billboard Hot 100 chart. It is a famous example of a song that uses the Bo Diddley beat. "I Want Candy" was written by Bert Berns, Bob Feldman, Jerry Goldstein and Richard Gottehrer in 1965. As writer/producers, Feldman, Goldstein and Gottehrer had already scored big hits for other artists, including "My Boyfriend's Back" by the Angels. For this song, the trio took on the moniker of the Strangeloves, and recorded the tune themselves, augmented by studio musicians (co-writer Berns was not involved in the studio recording). The female vocalist heard half-screaming, half-singing "Baby!" in the middle of the track was an unknown session singer. Although Feldman, Goldstein and Gottehrer used their real names in the writing and production credits of this single, they claimed the Strangeloves were actually three Australian brothers (and ex-sheep farmers) named Giles, Miles and Niles Strange. Feldman, Goldstein and Gottehrer dressed up in shaggy wigs and exotic clothing for publicity photos as the Strangeloves. 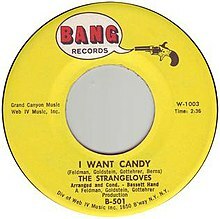 "I Want Candy", the Strangeloves' second single, became a top 10 hit in Canada and hit No. 11 in the US. The record failed to chart in the UK—or in the Strangeloves' so-called "native" country, Australia. "Go Wild in the Country"
English new wave group Bow Wow Wow released their version as the first and only single from their EP The Last of the Mohicans. For many in America, "I Want Candy" was their first introduction to young lead singer Annabella Lwin and the band. The song barely scraped the Top 50, but became an enduring new wave classic. To capitalize on the success of the "I Want Candy" music video, RCA compiled an album called I Want Candy for their newfound American audience. The album peaked at No. 123 on the Billboard 200. No. 86 on VH1's "100 Greatest Songs of the '80s"
No. 8 on VH1's "100 Greatest One Hit Wonders of the '80s"
Candy Girls, consisting of Rachel Auburn and Paul Masterson, released a cover of "I Want Candy", which became their third hit single in 1996, peaking at No. 30 in the UK. It was their last release. After releasing this single, the duo split. Masterson went on to have hits as Amen! UK, Clergy, Yomanda, Dorothy and Hi-Gate. (2000) "Aaron's Party (Come Get It)"
Aaron Carter released a cover of "I Want Candy" as his seventh overall single, and the second single from his second album, Aaron's Party (Come Get It) (2000). This version of "I Want Candy" begins with a phone conversation with a friend about a girl named Candy and features the participation of his brother Nick Carter from the Backstreet Boys. Carter promoted it by performing it on the show Lizzie McGuire. A music video was produced to promote the single, directed by Andrew MacNaughtan. Carter released a remix of the song in 2018, self-produced on his LøVë album. "I Want Candy" was the second single to be taken from Melanie C's fourth album This Time, in the UK, Denmark and Italy. The song was also the soundtrack to the movie of the same name, and the video featured Melanie dancing for the first time since the Spice Girls. Melanie split her time between the UK and Europe, where she was promoting "The Moment You Believe", and as a result, the single was not heavily promoted and reached No. 24 — although on the physical chart, the single reached No. 7. "I Want Candy" went on to sell 12,510 copies in the UK, but had better success in Italy (No. 9) and Denmark (No. 12). Melanie premiered her version of the song during Al Murray's Happy Hour on ITV1 on 24 February 2007. The video was premiered on 2 March 2007 in the UK. The song was released as Italy's and Denmark's first single from the new album, where it reached No. 9 in both countries, while in other European countries, the ballad "The Moment You Believe" was chosen. In the video for "I Want Candy", Melanie C is featured in a skin-tight catsuit, featuring a sexually suggestive dance routine with half-naked bodybuilders in crowd-controller uniforms. The video instantly grabbed the No. 1 spot on YouTube with 200,000 hits in its first day. These are the formats and track listings of major single releases of "I Want Candy" by Melanie C.
In the UK, the song first hit the UK Singles Chart in 1965, covered by Brian Poole and The Tremeloes, who took it to No 25. This version also peaked at No. 81 in Australia. ^ Demalon, Tom. "Bow Wow Wow – I Want Candy". AllMusic. Retrieved June 18, 2014. The song, a cover of a Strangeloves hit (...) became an enduring new wave classic. ^ "Bow Wow Wow – Awards". AllMusic. Archived from the original on October 20, 2014. Retrieved June 26, 2018. ^ Greenblatt, Leah (April 7, 2009). "VH1's 100 Greatest One Hit Wonders of the '80s: Do You Agree?". Entertainment Weekly. Retrieved December 27, 2018. ^ "Forum – ARIA Charts: Special Occasion Charts – CHART POSITIONS PRE 1989". Australian-charts.com. Hung Medien. Retrieved June 18, 2014. ^ "Ultratop.be – Bow Wow Wow – I Want Candy" (in Dutch). Ultratop 50. ^ "The Irish Charts – Search Results – I Want Candy". Irish Singles Chart. Retrieved June 24, 2013. ^ "Nederlandse Top 40 – Bow Wow Wow - I Want Candy" (in Dutch). Dutch Top 40. Retrieved June 24, 2013. ^ "Dutchcharts.nl – Bow Wow Wow – I Want Candy" (in Dutch). Single Top 100. Retrieved June 24, 2013. ^ "Charts.nz – Bow Wow Wow – I Want Candy". Top 40 Singles. Retrieved June 24, 2013. ^ "Official Singles Chart Top 100". Official Charts Company. Retrieved June 24, 2013. ^ a b c "Bow Wow Wow – Awards". AllMusic. All Media Network. Retrieved June 24, 2013. ^ "CASH BOX Top 100 Singles – Week ending JULY 3, 1982". Archived from the original on September 20, 2012. . Cash Box. ^ "Australian-charts.com – Candy Girls – I Want Candy". ARIA Top 50 Singles. ^ "Top RPM Dance/Urban: Issue 9875." RPM. Library and Archives Canada. Retrieved March 14, 2018. ^ "Eurochart Hot 100 Singles" (PDF). Music & Media. Vol. 13 no. 50. December 14, 1996. p. 12. Retrieved June 25, 2018. ^ "Official Scottish Singles Sales Chart Top 100". Official Charts Company. Retrieved July 4, 2018. ^ "Official Singles Chart Top 100". Official Charts Company. Retrieved March 14, 2018. ^ "Official Dance Singles Chart Top 40". Official Charts Company. Retrieved March 25, 2018. ^ Koman, Tess (February 16, 2018). "So Aaron Carter Just Dropped an 'I Want Candy' Remix". Cosmopolitan. Retrieved February 20, 2018. ^ "Australian-charts.com – Aaron Carter – I Want Candy". ARIA Top 50 Singles. Retrieved June 24, 2013. ^ "Lescharts.com – Aaron Carter – I Want Candy" (in French). Les classement single. Retrieved June 24, 2013. ^ "Offiziellecharts.de – Aaron Carter – I Want Candy". GfK Entertainment Charts. Retrieved June 24, 2013. ^ "Nederlandse Top 40 – week 41, 2000" (in Dutch). Dutch Top 40 Retrieved November 15, 2018. ^ "Dutchcharts.nl – Aaron Carter – I Want Candy" (in Dutch). Single Top 100. Retrieved June 24, 2013. ^ "Official Scottish Singles Sales Chart Top 100". Official Charts Company. Retrieved November 15, 2018. ^ "Swedishcharts.com – Aaron Carter – I Want Candy". Singles Top 100. Retrieved June 24, 2013. ^ "Official Singles Chart Top 100". Official Charts Company. Retrieved November 15, 2018. ^ "Official Independent Singles Chart Top 50". Official Charts Company. Retrieved November 15, 2018. ^ "Home". MelanieC.net. Retrieved February 1, 2012. ^ "Danishcharts.com – Melanie C – I Want Candy". Tracklisten. Retrieved June 18, 2014. ^ "Italiancharts.com – Melanie C – I Want Candy". Top Digital Download. Retrieved June 18, 2014. ^ "Official Scottish Singles Sales Chart Top 100". Official Charts Company. Retrieved March 22, 2014. ^ "Official Singles Chart Top 100". Official Charts Company. Retrieved June 18, 2014. ^ Roberts, David (2006). British Hit Singles & Albums (19th ed.). London: Guinness World Records Limited. p. 535. ISBN 1-904994-10-5. ^ "Forum – ARIA Charts: Special Occasion Charts – Chart Positions Pre 1989 Part 4". Australian-charts.com. Hung Medien. Retrieved June 18, 2014. "Aaron's Party (Come Get It)"
"That's How I Beat Shaq"
"Not Too Young, Not Too Old"
"Leave It Up to Me"
See Jungle! See Jungle! Go Join Your Gang Yeah, City All Over! Go Ape Crazy!